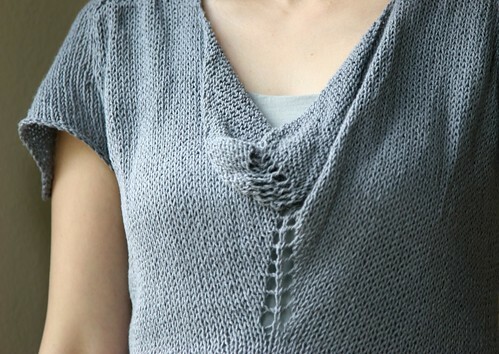 Notes: I loved this pattern from the moment I saw it and am very happy with the results. 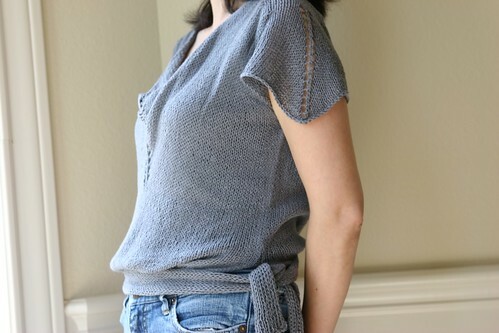 There is currently an error listed for the back piece, and I suspect there is an error in the sleeve/armhole directions–am waiting to hear back about that as of 4/28/09. I would strongly recommend you buy extra yarn. I did use a different yarn than recommended, but the yardage is nearly identical. I made the smallest size, which calls for 4 balls, and I thought I would be safe since the next size up also called for 4 balls. But I had to make my sash 42” instead of the 34” the pattern says in order to make sure that the sash could tie and stay tied properly. I needed a whole ball just for that, and I had basically nothing left over. -Last row: K2tog to end, casting off as you go. Thanks to TechKnitter’s excellent instructions for doing the beginning and end of the neckline bindoff stitches, I got a beautiful edge with no ugly gaps. That, combined with the fact that the fabric blocked out well and did not have any meaningful stockinette curl, meant that I was able to forego the crochet edging that the pattern suggests. 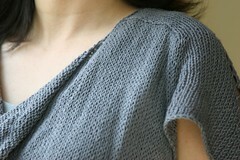 The yarn was great, blocked beautifully, and had the right mix of drape and body at this loose gauge.